Nestled in the beautiful Saluda River Club community, you will find this stunning new home in the Woodlands District: The Carmel. 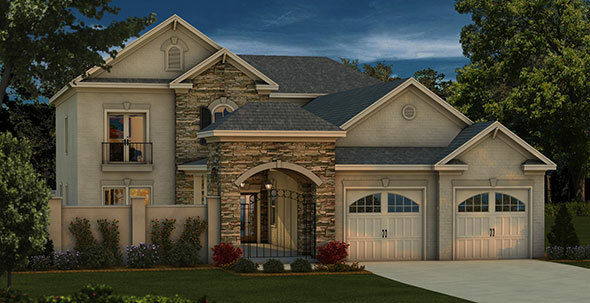 For selective new homebuyers who are looking to purchase a new home near Columbia, SC, the 4 bedroom, 3.5 bath home with a generous two-car garage may be exactly what they are searching for. Priced at $579,900, the beautiful 3,611 sq. ft. new residence by Lifestone Residential is located on a desirable lot, and features a fabulous master suite on the first floor. The Carmel offers three additional bedrooms upstairs, all with walk-in closets, one with a private bath, plus additional storage areas and a game room that may serve many different purposes. The Carmel’s elegant plan was designed with a private courtyard in front of the home, which allows homeowners lots of functional outside living space. The dramatic view from the foyer is filled with soft natural light that floods the elegant and spacious open floor plan, which is great for entertaining year-round. The only separation between the main living areas on the first floor are the elegant columns and the detail work on the ceilings. Whether preparing holiday parties or everyday family meals, the kitchen’s high-end appliances, including luxury stainless steel appliances, a gas cooktop, luxury finishes and custom cabinetry, are much appreciated by families and empty nesters alike. To learn more about this home in the Woodlands District and other homes at Saluda River Club, please schedule a visit soon. For more information or directions, please call 803-358-3969 or visit www.saludariverclub.com.